On the Scottish island where I grew up there’s a signpost where two arms pointing in opposite directions show the same destination. Sometimes similar happens when it comes to coming up with things to write about. 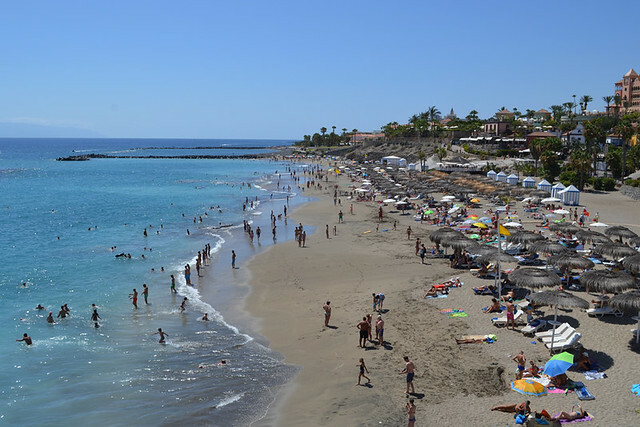 Recently a handful of ‘signs’ online quite clearly led to the same topic – the difference between resorts in the south, predominantly the main southern trio of Los Cristianos, Playa de las Américas, and Costa Adeje compared with Puerto de la Cruz. 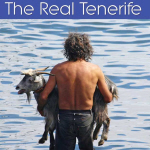 In 2003, after checking various parts of Tenerife, we chose the north of the island to live in as it suited us perfectly. However, over the years as well as staying in over 30 hotels in the southern trio mentioned above we’ve interviewed chefs and restaurant owners in the resorts, shadowed DJs, and trawled bars and clubs for various travel articles… and so on. The southern trio and Puerto de la Cruz are contrasting places in many ways. I started a list and gave up when I got to 20 ways in which they differ. I’m not going to subject you to all those, only ten of them. The promenade in Puerto de la Cruz. 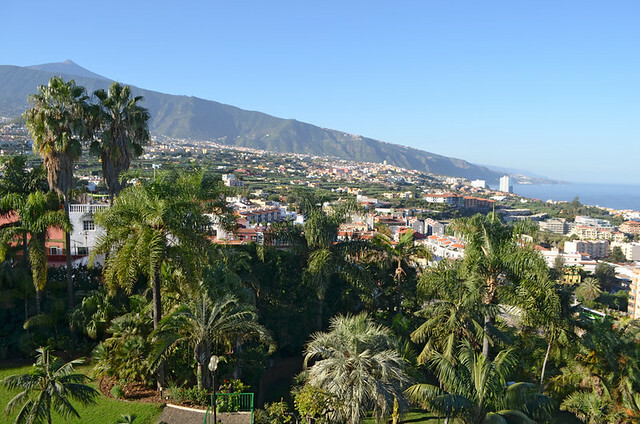 The Port of Orotava (now Puerto de la Cruz) began life as a small fishing village at the start of the 16th century. 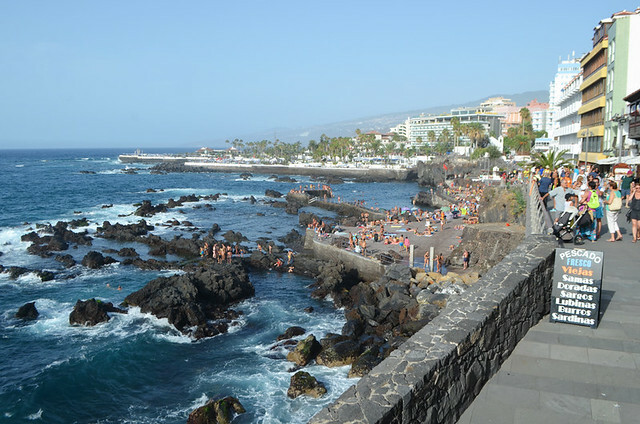 After the 1706 eruption which changed Garachico’s fate, it became the main port for Tenerife. Basically, there has been a thriving town on the spot since the conquest. Subsequently traditions run deep. 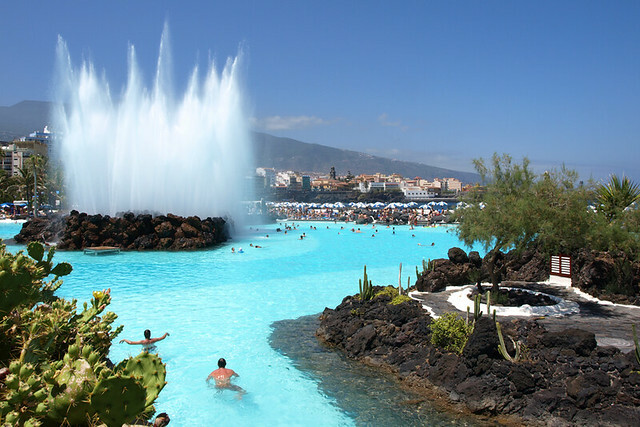 Both Las Américas and Costa Adeje’s resorts exist only as a result of tourist developments. Los Cristianos is the most traditional of the trio, but only became a town in the 1960s. Having historic roots makes a huge difference in the personality of any destination. Seafront promenade at Los Cristianos. 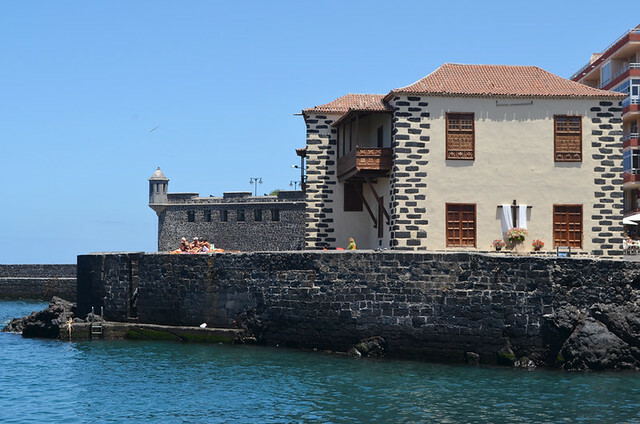 The old customs house in Puerto de la Cruz. Compare walking through a modern housing/tourist development with a stroll through a barrio (neighbourhood) which has existed for five centuries. The vibe is not the same. Traditional Tenerife towns have colonial mansions, old plazas, and humble cottages with house leeks growing from their roofs. You’ll struggle to find these in the southern resorts mentioned. 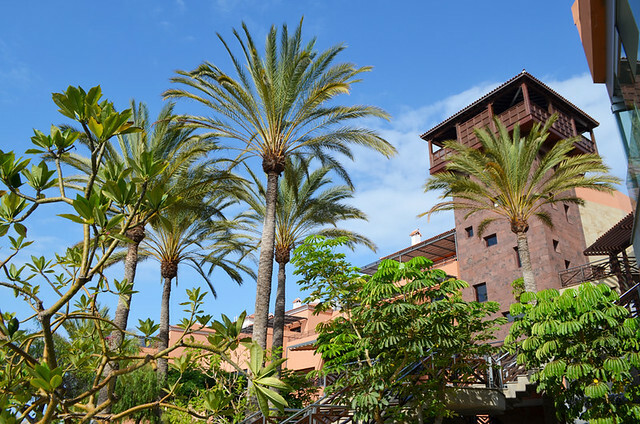 Mock traditional Canarian tower in a hotel in Costa Adeje. Restaurants in a side street in Puerto de la Cruz. 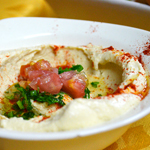 In the main southern resorts there is more international choice as restaurants are aimed primarily at visitors. 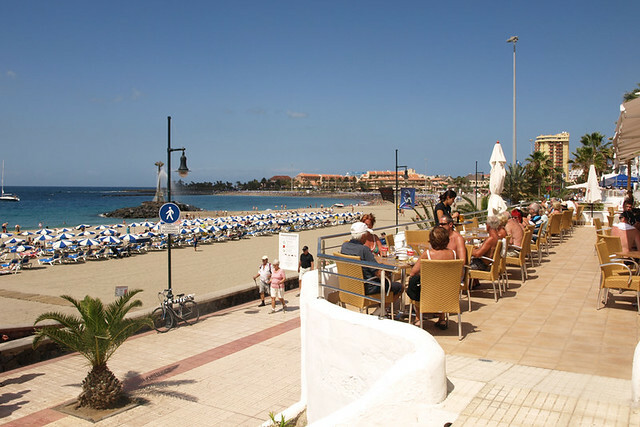 In Puerto de la Cruz, Canarian cuisine still dominates as restaurants are aimed at a mix of visitors and locals. We can illustrate this by using stats from Tripadvisor reviews for fish restaurants near the harbours in Los Cristianos and Puerto de la Cruz. At the time of writing, El Cine in Los Cristianos had 468 Spanish reviewers and 857 English language reviewers. La Tasquita de Min in Puerto had 232 Spanish reviewers and 54 English language reviewers. Note who dominates in each. 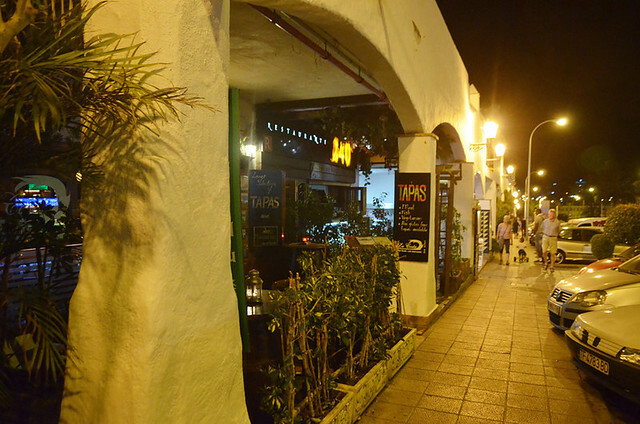 Restaurants in a side street in Costa Adeje. Apart from special occasions, or in a couple of restaurants aimed purely at visitors, live entertainment is not something which happens in restaurants in traditional areas. On the other hand, we’ve walked in despair past restaurant after restaurant in one area of Costa Adeje, dismissing each before we looked at the menu thanks to intrusive and cheesy live music. For me a good meal is sufficient entertainment. Live music with dinner is very much a resort thing. 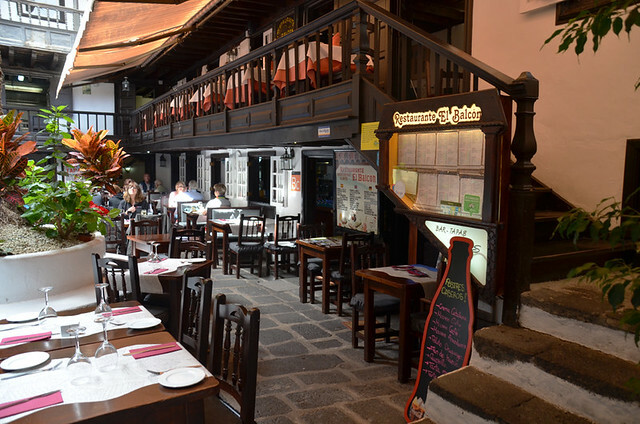 Tapas restaurant in an historic courtyard in Puerto de la Cruz. I often read comments Tenerife doesn’t really do tapas, despite the fact there are numerous tapas routes throughout the year on the island. It’s a view developed from experiences in purpose-built resorts where there aren’t atmospheric tapas bars like those in mainland Spain. In one example a recommendation for a tapas bar in Costa Adeje was actually for an Italian restaurant. 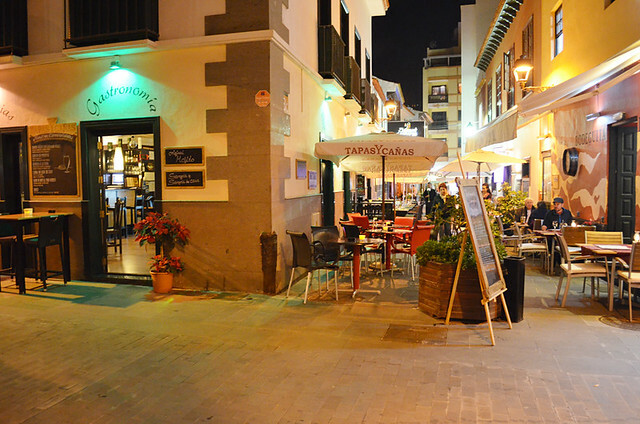 But authentic tapas bars/restaurants on Tenerife do exist in traditional towns, including Puerto de la Cruz. Tapas restaurant in a commercial centre in Los Cristianos. 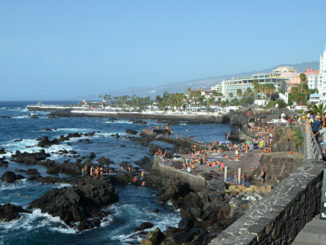 Costa Martianez swimming pool complex in Puerto de la Cruz. Forget looking for boat trips, karting tracks, and white-knuckle ride water parks in Puerto de la Cruz. 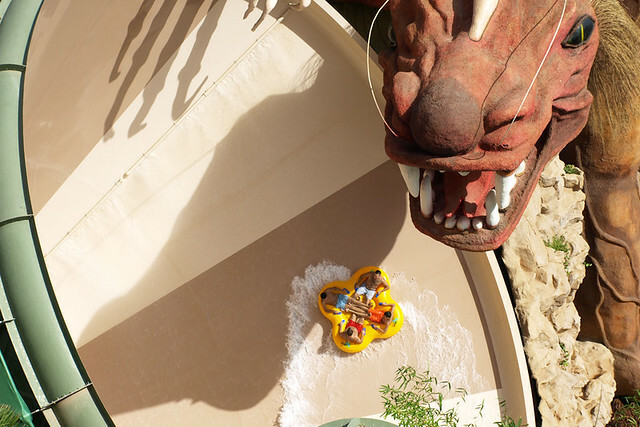 Apart from controversial Loro Parque, theme parks are scarce in northern parts. The southern resorts have been developed with the leisure preferences of visitors in mind whereas ‘activities’ in northern coastal towns tend to have more to do with culture, history and traditions. This is both a plus and a minus depending on personal preferences. Siam Park in Costa Adeje. Fishermen’s fiesta in Puerto de la Cruz. 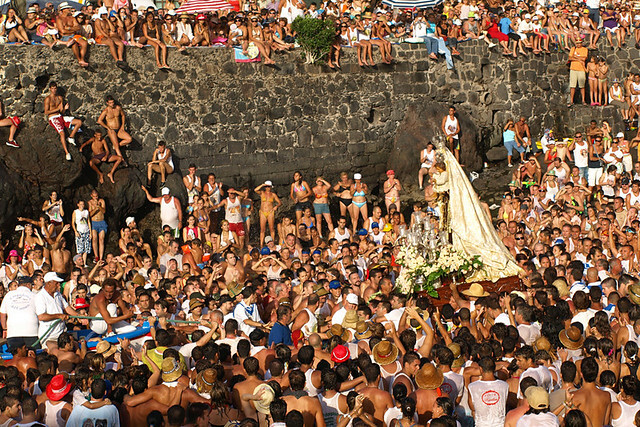 Fiestas are an integral part of traditional Tenerife life; every Tenerife town will notch up quite a few over the course of a year and thousands upon thousands of Canarios turn up for each. In recent years southern resort areas have introduced traditional activities to bring local culture to visitors, but they’re not the same as fiestas which have been observed for centuries. When you’ve been to fiestas in both areas you don’t need to be told why or how they differ. 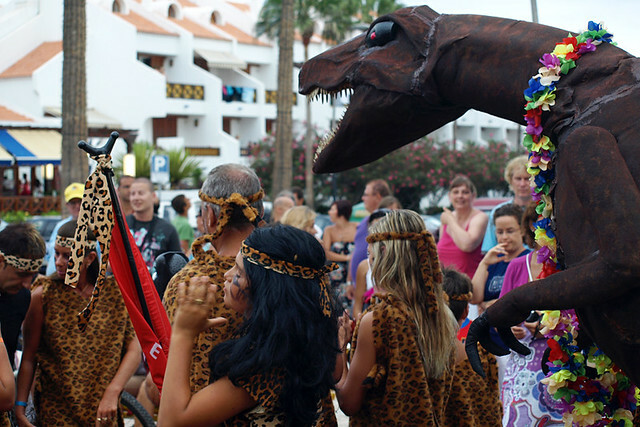 Carnival parade in Las Americas. 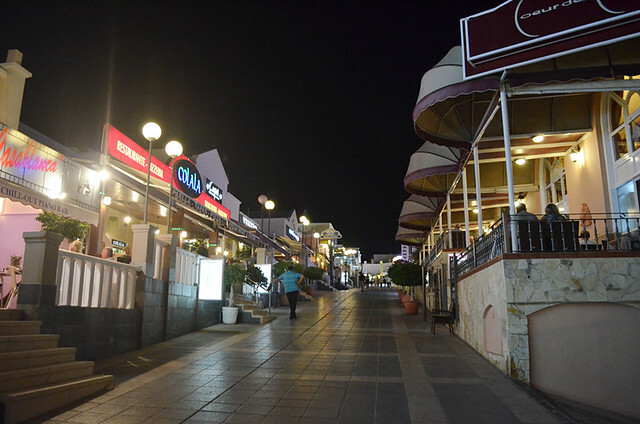 Nightlife in Puerto de la Cruz. For holiday bars designed to show visitors a good time, the southern trio excel. 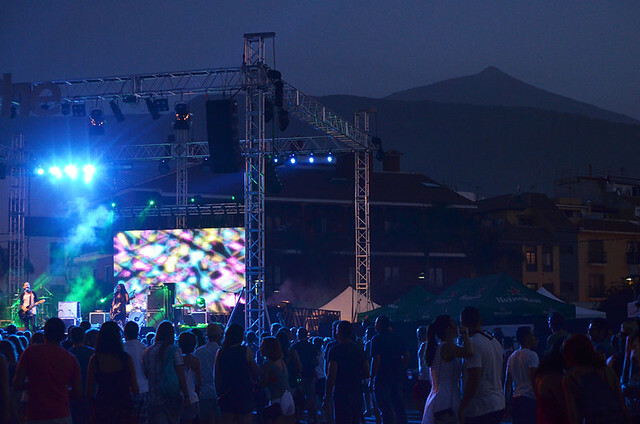 There are a handful of bars in Puerto de la Cruz aimed predominantly at holidaymakers, but the best of the night scene exists primarily for locals – open air events, mini festivals and bars which don’t hit their stride till after midnight, which is why some still fly under the radar of visitors who view midnight as being the end of the night. This ‘local’ later scene does exist in parts of the three southern resorts as well but it’s not the dominant one. 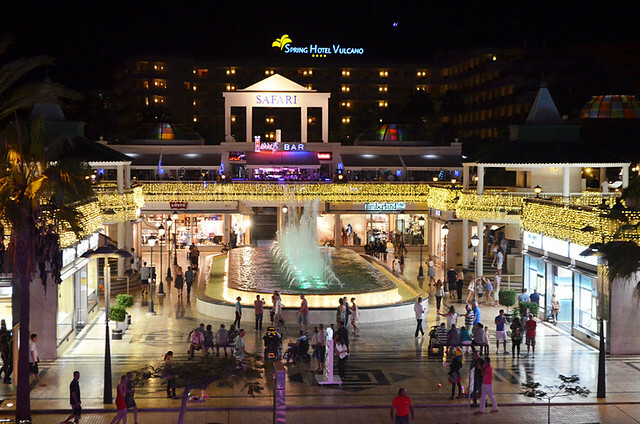 Nightlife around the Safari Centre in Las Americas. Mountain backdrop,, Puerto de la Cruz. 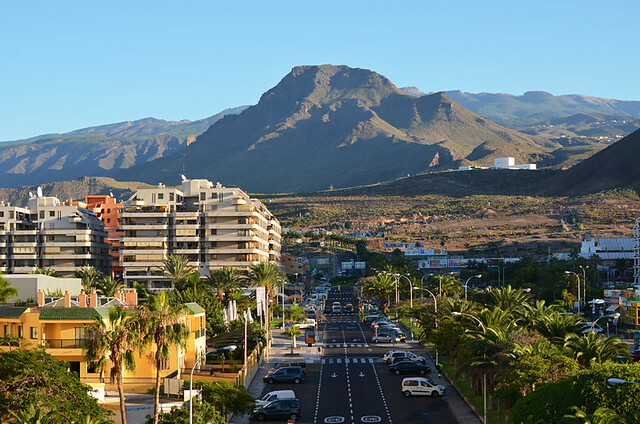 From coastline to mountainous backdrop, the scenery surrounding resorts on both sides of Tenerife is a bit of an epic indicator of the contrasts between them, with or without Spain’s highest mountain adding its dramatic bulk. Beach life Puerto de la Cruz. I’m not going to dwell on this one as we’ve covered it more times than I’ve eaten papas arrugadas. The weather is different, there’s no arguing with that. Maybe not as extremely different as is often painted, and it is relative, but the southern resorts enjoy more sunshine and less rain. Beach life at Playa del Duque, Costa Adeje. The ingredients found in Puerto de la Cruz suited our preferences, that’s why we chose to live there in the first place. However, the differences are not something which should be viewed as a competition – it serves no purpose to try to pass off the southern resorts as being more traditional than they really are, or to say Puerto is an ideal location for those just seeking sun and sand holidays. All that achieves is potentially pointing people to a destination which may not suit them – nobody wins from that scenario. 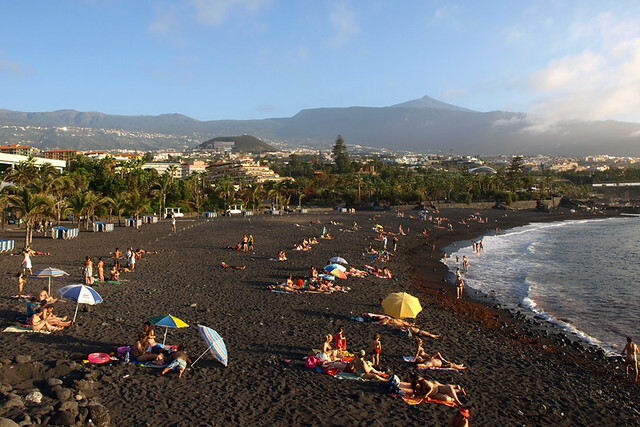 These differences are partly what make Tenerife such an attractive holiday destination, the contrasting personality of resorts and traditional towns across the island appeal to potential visitors with a wildly diverse range of preferences. 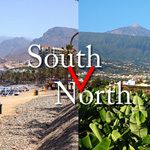 Tenerife North v Tenerife South, Which is Best to Visit?